We recently told you about the Exynos4 security hole found by XDA Member alephzain. This is a security hole in the kernel that allows malicious code full access to all physical memory. 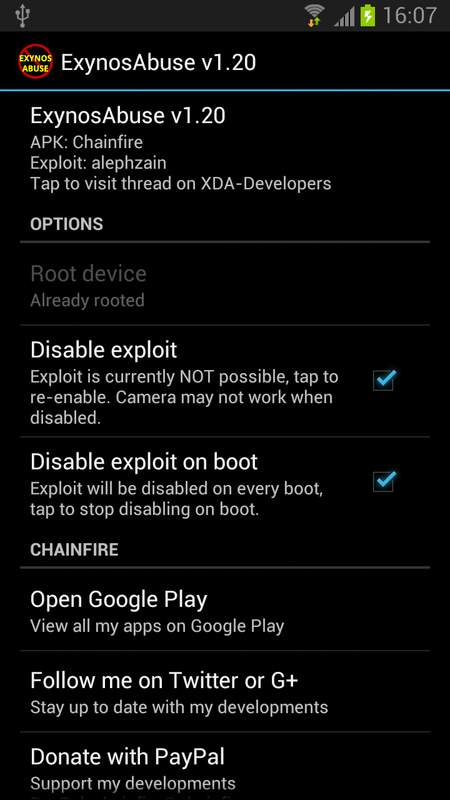 XDA Elite Recognized Developer Chainfire would have none of it, and not only pointed out the security hole by creating an app that roots your device without ODIN, but also provided a way to plug it. His application, aptly named ExynosAbuse APK, gains root privileges via the ExynosAbuse exploit and installs SuperSU. In addition, in version v1.10, it allows you to disable the exploit at boot. The downside of disabling the exploit is that your camera may break. However, this is not so bad considering how your device can no longer be compromised by this exploit. Lesser of two evils, right? If you absolutely must have your camera, the application allows you to re-enable the exploit. For more details on the exploit, you can head over to alephzain’s exploit thread or Chainfire’s application thread. When visiting the latter, be sure to help Chainfire test various Samsung devices by stating your device, its firmware, and whether the application and fix worked.